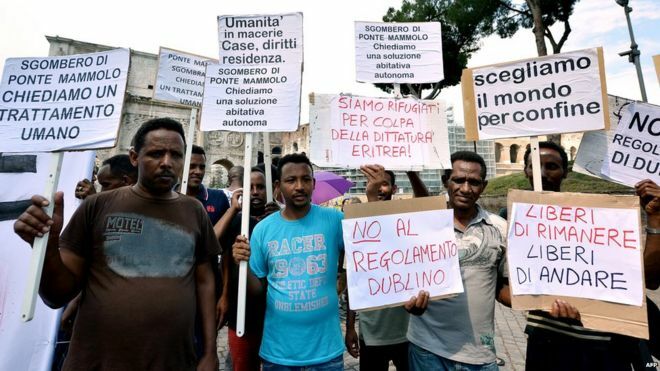 Eritrean migrants in Rome press for rights as refugees who fled from "a dictatorship"
The exodus from Eritrea is complicating Europe's efforts to tackle the Mediterranean migrant crisis. Eritreans - struggling ashore or picked up at sea - form the second-largest group of migrants risking their lives to reach Italy, after Syrians. 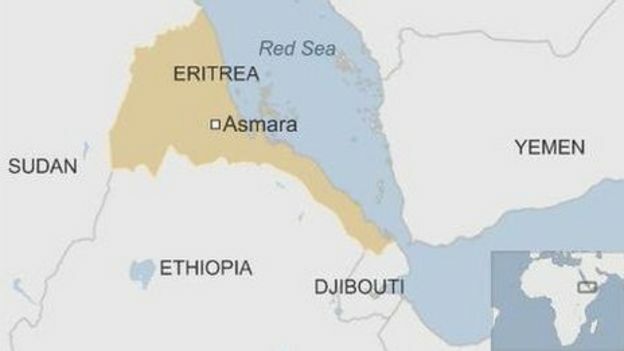 Eritrea, in the Horn of Africa, is not in the grip of war or famine. Yet around 5,000 Eritreans flee every month. Why? A damning United Nations Commission of Inquiry report blames the country's "gross human rights violations". "Faced with a seemingly hopeless situation they feel powerless to change, hundreds of thousands of Eritreans are fleeing their country," the UN says. Indefinite national service is one of the main drivers, according to the report. Everyone from the age of 17 can be conscripted into the military, and it continues for years. Some conscripts have served for more than 20 years. UN investigators say "slavery-like practices" are widespread, with conscripts subjected to hard labour, with poor food, bad hygiene and wretched pay. 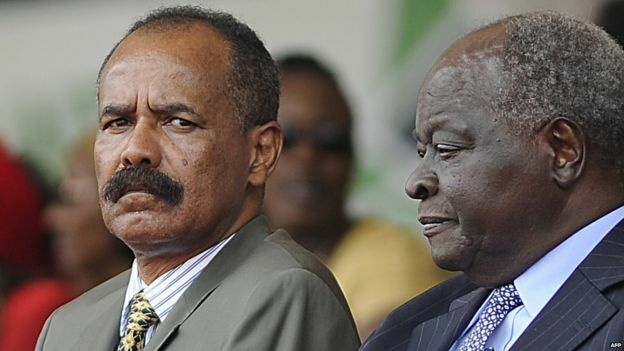 The Eritrean government has dismissed the UN's findings as "totally unfounded and devoid of all merit". Yet for most Eritreans, it is impossible to get an exit visa to leave the country legally. And by fleeing conscription they risk being arrested as "traitors" if they return. The EU cannot send Syrian refugees back to their war-torn country. And Eritreans' asylum claims have generally been treated as legitimate in the EU. But despite the abuses in Eritrea, documented by the UN and human rights groups, some countries are now considering sending Eritreans home. A Danish Immigration Service report, from November 2014, suggested that Eritrea's policy towards returnees had become more lenient. It was based on a fact-finding mission, but did not name its sources. It quoted the Eritrean Foreign Ministry as saying Eritreans abroad could now "regularise their relationship with the authorities" by paying a 2% income tax at an Eritrean embassy and signing an apology letter. 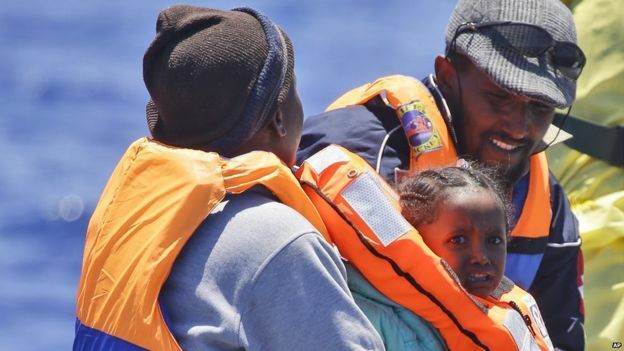 "This has been done by a number of people and they have returned to Eritrea without any complications," the report said, quoting a ministry statement. But the ministry gave "no specific information" about whether Eritrea's national service would be changed. The report was criticised by Danish media and Human Rights Watch, which described it as "more like a political effort to stem migration than an honest assessment of Eritrea's human rights situation". The Norwegian government sent its own assessment team to Eritrea. It was led by Norway's Deputy Minister of Justice Joeran Kellmyr. Speaking to the BBC, Mr Kellmyr said he had received an assurance from Eritrea's foreign minister that national service would be reduced to 18 months. "It's important for everyone," said Mr Kellmyr. "If national service is reduced, according to human rights standards, this could mean that a lot of Eritrean people don't any more have the right to seek asylum." In December UK officials also visited Eritrea to discuss the migration problem. And in March this year a new UK policy towards Eritrean asylum-seekers was announced. New guidelines stated that conscription would no longer be automatic grounds for granting asylum, since national service would no longer continue indefinitely. But an Eritrean migration expert, Prof Gaim Kibreab, said there was "no evidence" for the UK guidelines' assertion that "national service is generally between 18 months and four years".